I bought apple scent one year when we made apple scented soaps. Every fall now I get excited to get the apple scent out and see what playtime fun we can have with it. My son was looking for something to do and I started brainstorming apple, fall, sensory, crafts, hummm what to do. 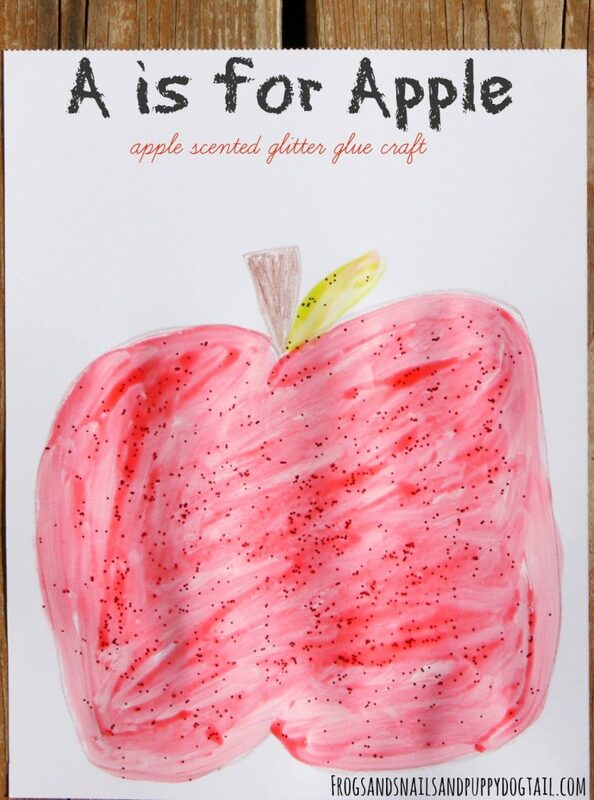 Then Apple Scented Glitter Glue came to mind. 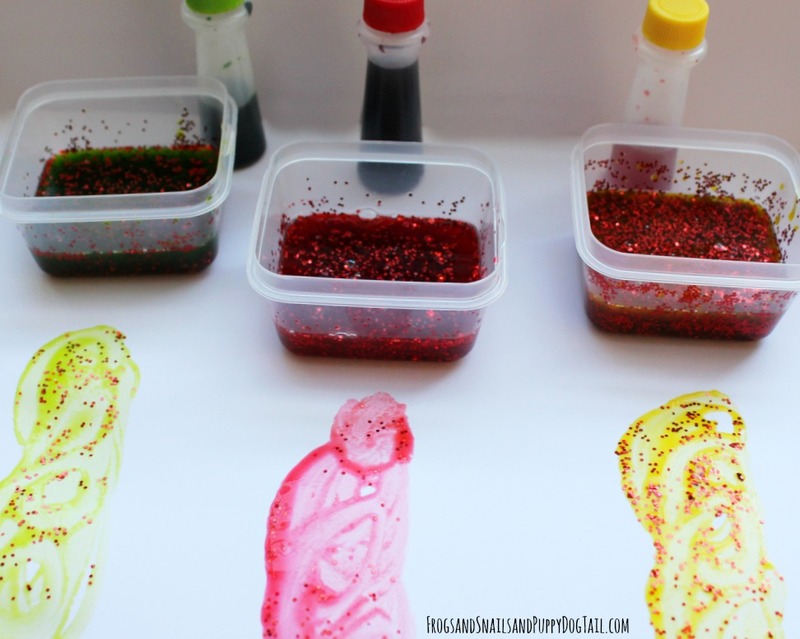 We whipped up a batch of scented glitter glue. This was the perfect time to go over the letter A is for apple while working on our fun apple craft. 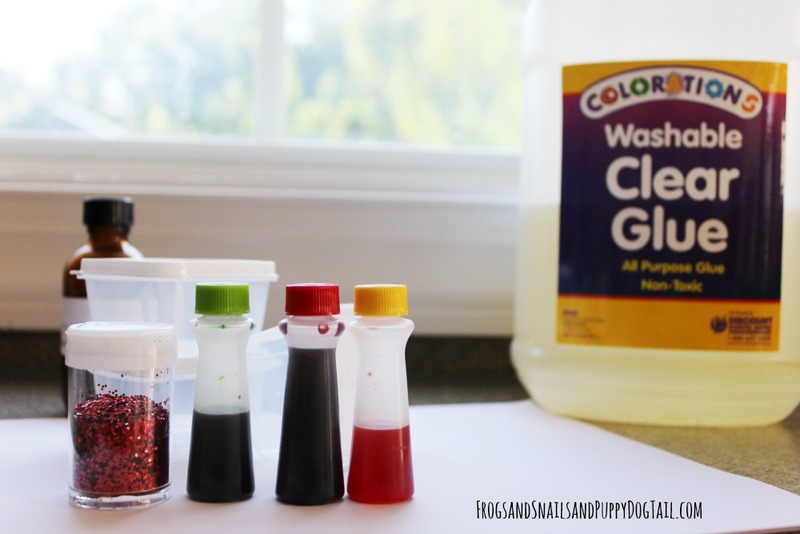 We have made glitter glue and scented colored glitter glue before. 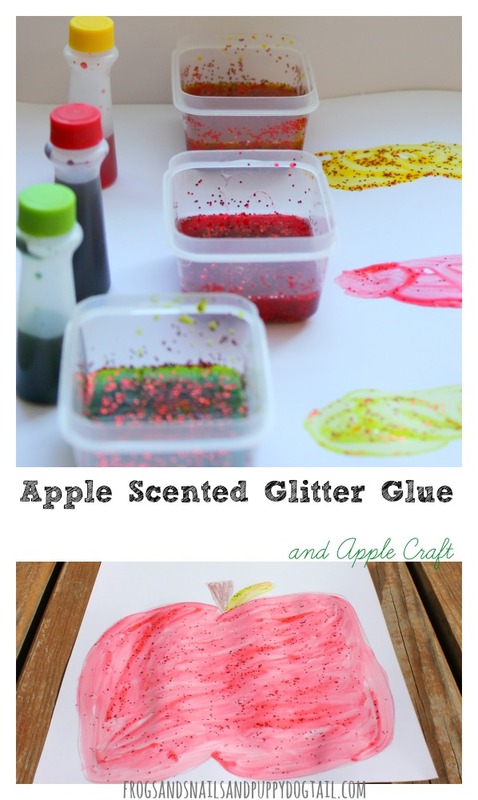 We did the same thing for the Apple Scented Glitter Glue. This time I just used little containers instead of squeeze bottles. My anxious 3yr could not wait for me to set him up for painting. 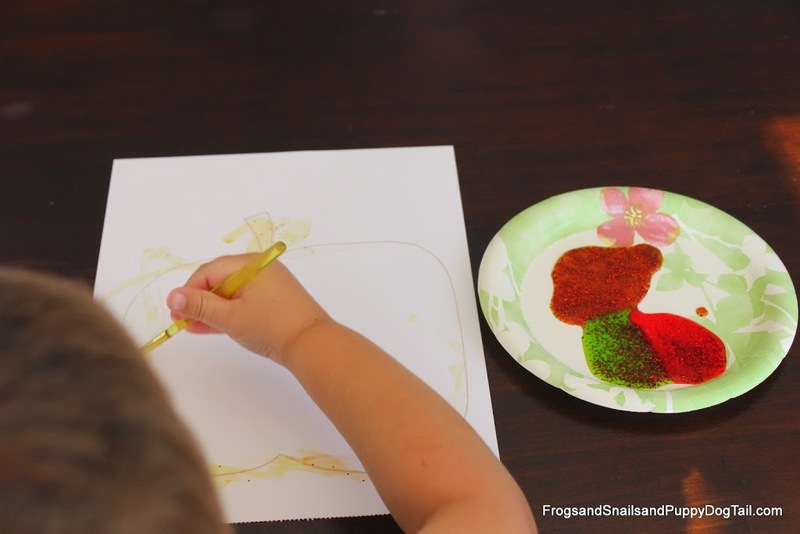 I set him up with all 3 colors of glitter glue (red, green, and yellow) on a paper plate. I took white paper and traced an apple on it with a brown pencil. Then he started painting it with the glitter glue. This is my new favorite apple craft from us right now. I love all the sparkle it has and the amazing scent of apple when you walk by it hanging on the wall. It was a fun way for us to go over A is for apple too. What a cool idea. I love how how it’s texture, scent, and creativity all in one. Thank you for sharing earlier today on our Facebook page. 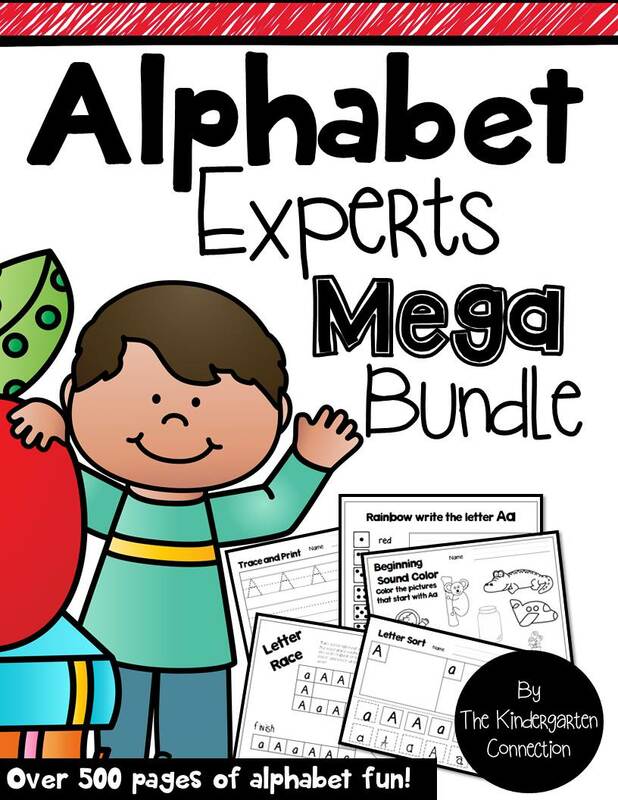 I can’t wait to try this with my kiddos.